Barack Obama, the 44th president of the United States, flew to New York City today to speak to the United Nations about a range of issues from climate change to the war he just started against ISIS militants in Syria. But many of the headlines were focused on something far more trivial. Obama debarked Marine One with a cup of coffee in his hand, and when he went to salute the Marine standing by the helicopter, he kept the cup of coffee in his hand. If there was ever any doubt how this Commander in Chief really feels in his heart about our men and women in uniform, this should seal the deal. We have warriors engaged in harm’s way, and he does THIS? The latte salute. And he has the nerve to publish it on his Instagram account. Disgraceful. But here's the issue: There's no regulation that stipulates presidents must salute the troops. In fact, for the first 192 years of our republic, it didn't happen. None of the first 38 commanders in chief did it. And some of those dudes had some serious military experience. Eisenhower? Grant? I mean, Teddy Roosevelt was a war hero. Surely he felt compelled to click his heels together and cut a perfect knife-handed salute when he passed a uniform service member, right? Wrong. It was literally something that Ronald Reagan made up one day. Soldiers were supposed to salute their president; the president was not supposed to salute the soldiers. No modern president, not even old General Eisenhower, had saluted military personnel. It might even be, well, sort of, improper. Reagan seemed disappointed at this news. Kline suggested he talk to the commandant of the United States Marine Corps and get his advice, and the commandant’s advice ran something like this: You’re the goddamn president. You can salute whoever you goddamn well please. So Ronald Reagan continued saluting his soldiers, and he encouraged his own vice president and successor, George H.W. Bush, to do the same. And every president since has followed. And that's it. Now all the presidents do it because of the theater of the office. And because the media and pundits would take offense if they didn't. Presidents salute the troops to avoid the very mess Obama just stepped in. So now thousands of people got their jimmies rustled because the busiest and most important man in the world forgot to switch his pumpkin-spice latte from his right hand in following an imaginary protocol on his way to address the United Nations about a war he just entered. I can't imagine what possibly could have been on his mind. This isn’t the first time Obama has botched the salute. Last year, the president boarded Marine One without saluting the Marine by the door. Realizing his mistake, he quickly debarked and shook the young corporal’s hand, telling him, I assume, how profoundly sorry he was for offending him. For the past six years, the Obama administration has been plagued by accusations of being everything from treasonous to unpatriotic and distant from the military community. It’s a largely partisan critique of a liberal president, and Obama’s critics have often bent history to pretend his predecessors behaved differently and that the president has failed to meet some sort of standard. 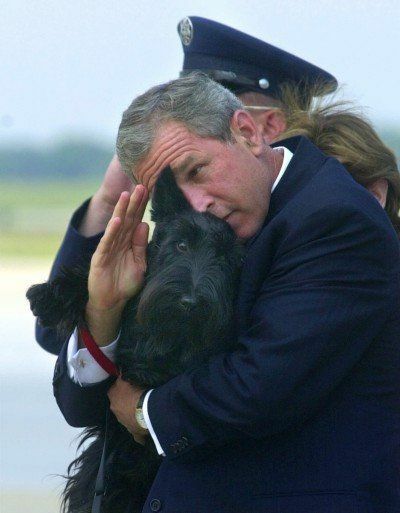 In the summer of 2001, George W. Bush saluted the Marine One crew chief with his Scottish Terrier Barney under his arm. It looked absolutely ridiculous. No one, however, questioned Bush’s patriotism. No one said that his dog salute meant that he lacked respect for the Marines or hated the troops in his heart. When Maj. Gen. Harold Greene was killed in Afghanistan earlier this summer, critics blasted the president for not attending his funeral. Retired Air Force Col. Morris Davis claimed that Obama “bucked tradition” since Richard Nixon attended the funeral of Maj. Gen. John Dillard when he was killed in Vietnam in 1970 and George W. Bush attended Lt. Gen. Timothy Maude's funeral when he was killed on Sept. 11, 2001. But for one problem — Nixon didn’t attend Dillard’s funeral, nor did Bush attend Maude’s. Davis later said that he was kidding and baiting Obama critics. If someone deserves blame for this, it’s the operative behind the White House Instagram account who posted the video in the first place. Why post a video of a sloppy salute? Isn’t that just begging for the criticism? It was sloppy, ignorant to the sensitivities of the criticisms this president faces, and absent of the high standard created by social media in the 21st century.